Members of Beku-Onimaba Ruling Family of Igando, Lagos State, have lamented that the Lagos State Government, is making attempts to revoke its right of ownership of 52.15 acres of land situated along the Lasu-Isheri Expressway, which was recently given back to them, by the Federal High Court, Ikoyi. 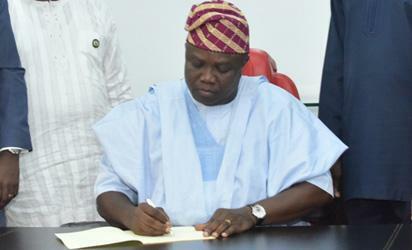 Vanguard gathered that the government, had through a letter, which was allegedly signed by the state governor, Akinwumi Ambode, threatened to revoke the family’s right of ownership of the said land. But, members of the Beku-Onimaba Ruling family told Vanguard in an interview that they were surprised to receive the revocation letter. They told Vanguard that they took the Lagos and Federal Government to court in year 2012, when they discovered that the said parcel of land which they originally ceded to the Federal Government for the purpose of the National Youth Service Corps, NYSC, in 1983, was being used for commercial purposes and some of them allotted to politicians and traditional rulers within Igando, Lagos State. The head of the family, Ganiyu Ige, told Vanguard that his family secured a judgment over the said parcel of land in March 13, 2017, from the Federal High Court, Ikoyi. The post LASU-ISEHRI ROAD: Family laments attempt to revoke ownership of 52.15 acres of land appeared first on Vanguard News.